Evolution can be described as either male dominant or female dominant. The female dominant model of human evolution raises the question of who evolved first- the male or the female. The original fossils of human species are predominantly female and the male fossils evolved after billions of years. The original human species would have been a cluster of female bipedals in swampy waters feeding on tubers of water lilies and lotus as well as fish, mussels and shell fish. The women can reproduce by parthenogenesis like lower animals. Therefore it is natural for the female of the species to evolve first. Therefore it is natural for the female of the species to evolve first. The evolution of males occurred at a later date. The next stage of human evolution has been postulated to be interspecies hybrids. The early bipedal female only human species would have generated human ungulate interspecies hybrids. This would have generated interspecies hybrids of males and females. 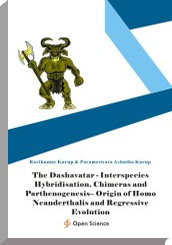 Thus human evolution especially that of homo neanderthalis points to an aquatic origin, initial evolution of the female of the species and interspecies hybridisation.